Use Inventory/Production Manager to streamline production by integrating batch preparation with available parts and ingredient stock. Create a new batch record. SDScribe™ can make a complete clone a previous batch, create the ingredients from a Substance record, or allow you to create a completely new bill of materials (BOM, or "batch recipe") and instructions. If desired, scale the batch to a different size. SDScribe™ recalculates ingredient amounts and part quantities, in your selected units of measure. Allocate the ingredients and parts needed for the batch against existing inventory. SDScribe™ automatically converts between warehouse stock units and batch units as necessary, and warns when stock levels are insufficient to produce the batch. Print a batch sheet for production workers to follow, logging the ingredient lots, time spent on each task, spillage, and observations. Upon entry of batch sheet information, SDScribe™ calculates batch and per-filled-container costs based on parts and ingredient costs, labor, and an optional percent mark-up. SDScribe™ can also attach a scanned copy of the completed batch sheet. Place the batch product into stock. SDScribe™ converts between batch units of measure and stock units as necessary. Both Substance and Part sections of SDScribe™ feature Quick Inventory modes for rapid entry of current stock and reorder levels. The Purchasing section can find all ingredients and parts that have fallen to or below reorder levels, and create purchase orders. 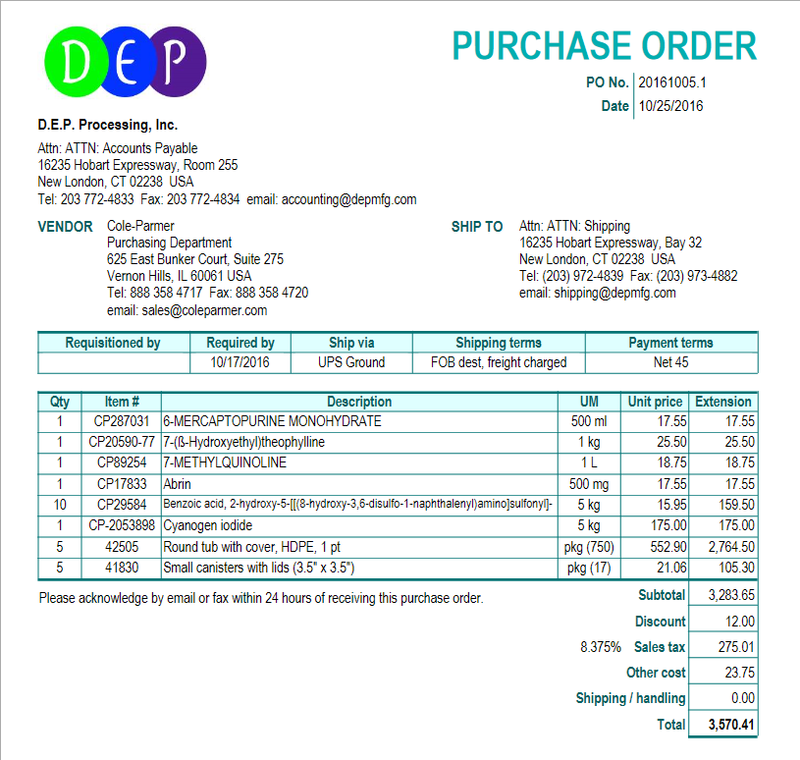 Items from the same supplier are combined into one purchase order for each supplier. 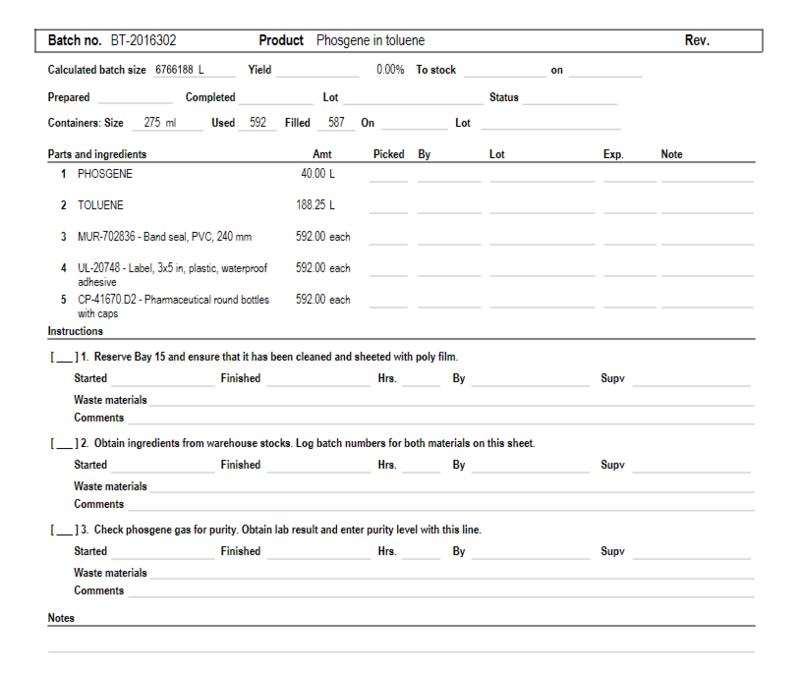 Upon receipt of items from suppliers, the warehouse staff can enter the amount or quantity received directly on the purchase order form, automatically replenishing part and ingredient stock levels.